The Urban Forest Stewardship Network is an online resource for organizations, community groups and individuals working on urban forest initiatives across Ontario. It is a platform for sharing experiences and resources, and for capacity building. 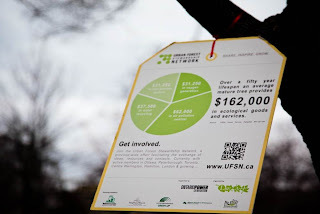 The Urban Forest Stewardship Network was initiated by LEAF (Local Enhancement and Appreciation of Forests) in an effort to bring together community based urban forest groups from across the province. One of their projects is to TAG URBAN TREES to show their value to those who benefit from them. These tags can be placed on street treets and trees in parks or even on your own front lawn to display the benefits in Air Pollution Control, Water Recycling, Oxygen Generation, etc. "The Urban Heat Island effect describes the relatively higher temperatures found in urban areas compared with rural surroundings, and is the result of several different factors. Building materials that absorb heat, the loss of moisture in the air due to reduced vegetation and paving over soil, as well as sources of heat, such as traffic, can all contribute to the Urban Heat Island. In this study, researchers recorded temperature and humidity between April and August at 12 sites located at different distances from a small river running through the city of Sheffield, UK. Sites were located in areas of different ‘urban form’; either in an open square, an open street, a closed street or completely enclosed by buildings. To quantify the effect of the river on temperatures, these measurements were compared with another site, which was distant from the river but similar in all other properties except that of altitude, which was accounted for in the analysis. The researchers conclude that rivers do have cooling effects and that future policies to uncover underground rivers could be of value in urban environments where high temperatures can have a negative effect on health and wellbeing. However, they stress that urban form surrounding the river corridor is more important than the simple presence or absence of a river and that cooling effects can be greatly enhanced by careful consideration of urban design." Hathway, E. A. and Sharples, S. (2012). The interaction of rivers and urban form in mitigating the urban heat island effect: a UK case study. Building and Environment. 58: 14-22. DOI 10.1016/j.buildenv.2012.06.013. 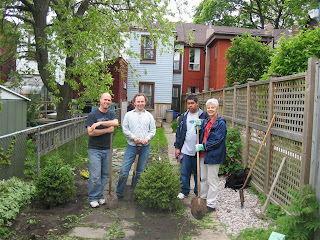 "U of T Forestry grad students (were hired) to go door to door signing up local residents for a free front yard tree to be provided by the City of Toronto. With tiny front yards in most of the 1600 single family homes, it was often tough to persuade residents of the value of front yard trees. But the Forestry grad students were good educators and approximately 100 residents submitted the City’s front yard tree application and obtained trees. To overcome the biggest challenge, the City’s Urban Forestry department (was convinced) to create a new brochure, explaining that trees were not to blame for broken sewer pipes or cracked foundations." The work here also included a tree inventory (of 5000 trees) and efforts for funding backyard tree planting also!